AT THE THEATRE: Priscilla Morris (left), an examiner for the London Academy of Music and Dramatic Art, talks to Dee Brock, of Tyler, during a welcoming reception at the Tyler Civic Theatre on Monday. As you know, I have been an examiner for LAMDA (London Academy of Music and Dramatic Art) for the past 22 years. They are the leading provider of oral communication and acting exams in the U.K. and are increasingly being asked to provide their services overseas. I have already worked for them in Singapore and Spain. This time I was asked to take the very first session in Texas at the delightful city of Tyler. I must admit I had never heard of this place but I found a little gem! Tyler is the home of the Texas rose, having the largest rose garden (around 38,000) in the world. It happened to be in full bloom when I arrived and I was given a wonderful East Texas welcome by a group of dedicated theatre managers, directors and tutors at the Tyler Civic Theatre Centre. 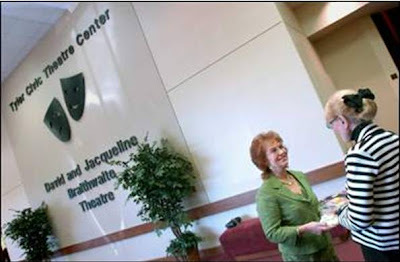 The centre has two auditoria, The Braithwaite Theatre for adult performances and the Rogers Children’s theatre. Both are theatre-in-the-round spaces and they are regularly in use for public performances. I saw a dress rehearsal of a musical version of ‘The Little Prince’ by the youth company which was quite wonderful. They were fantastic hosts, arranging an interview for the local newspaper, reception with theatre board members and local dignitaries, dinner at the Country Club (where the wine flowed freely) and, of course, a tour of the Rose Garden and it’s museum. My three days of examining ranged form introductory level to Gold Medal with all ages represented form 6 to adult (all of the teachers took an exam themselves). They had great enthusiasm and I’m sure they will take the examinations forward and grow interest in Texas a result. I hope I get the chance to go back one day. On the day I returned I had a taste of what the weather can do when local T.V. started warning of a severe storm with hail as big as golf balls and the risk of tornados. The sky was black and as we set off in the car towards Dallas Fort Worth airport lightning was striking the ground all around in the distance. When the rain hit you couldn’t see a thing! Luckily we only hit the edge of it but it was quite scary and something that the locals experience regularly during Spring and Autumn. I haven’t long to rest as the diary is pretty busy this month. On May 6th I am speaking on the use of voice in business to a group of business women in Northamptonshire. During this month I am examining in Oakham, Berkshire, Birmingham and Milton Keynes, a total of 6 days. Mid-month I am also adjudicating at Cheltenham and Wharfedale Festivals but I hope to have a week to relax at the end of the month. I mentioned last month that I was being filmed by Affixxius for my promotional DVD. We had a very successful and enjoyable day with all the invited colleagues and business representatives having a great time and, I hope, learning things about the voice which will translate into better business for them. Affixxius are screening the final cut for me on 15th May and I hope to have copies available for interested parties very soon after. There has been a lot in the news lately reminding us that we are an Island nation, historically reliant upon exports. I am actively promoting my company Loud & Clear abroad and Stewart and I found the 2 day ‘Passport to Export’ course run by the East Midlands branch of UK Trade and Investment to be very interesting and informative. I have interest already form Hong Kong, USA and Dubai and am hoping that my UKTI advisor will help me access routes to take this further. very loud and very fast. I could not understand her. marvellously out of the air. and water flouncing into them. I think we can all probably remember a special voice which has affected us in some way – perhaps several. The voice can have a really powerful effect. It’s my mission to ensure that everyone makes the very best use of it through understanding and confidence in its use. Remember that in the first six seconds of contact you make you mind up about whether you like a person. The vocal manner plays a major part in this. Think about how you come across. Are you sincere? Are you warm and friendly without being condescending? Take care………..Speak Wisely, Speak Well, Speak Loud & Clear!